We did nothing to promote the bot. No ads. No paid promotions. No splashy launch. We just put it in Kik’s Bot Shop and waited. (Full disclaimer: We work for Kik, and Roll has been our side project.) After 10 days, we had 200,000 users. Thirty days later, we had half a million. Today, we have more than 1 million users. Roll’s one-week retention is 90 percent. At two months, it’s 25 percent. We’re seeing an average of 25 messages per user per day. Roll started as an experiment. We wanted to build something that millions of people could use, but without the overhead of developing a full application for iOS and Android, which would have required more time, more money, and more reviews. We thought that a bot platform might provide a way to build something cool with significantly less work, and far less friction for people to adopt. Not only did that turn out to be true, but to our surprise, our bot would also spread like crazy. Bots have come in for their fair share of criticism since Facebook Messenger released its bot developer kit and Kik opened its Bot Shop in April. People are still confused about whether bots should be your chatty friends, reinventions of apps for a messaging context, or something else entirely. We might not be able to answer all your questions about bots, but we can tell you this: Roll has found more than a million users almost entirely on the strength of being shared peer to peer. We don’t think this could have happened as easily with an app. We had one simple plan when we set out to build Roll: make it work for group conversations. That’s easy to say, but not easy to execute. To make it happen, we needed people to actually want to ask the bot questions. We figured that one of the easiest ways to keep users engaged was to make it social. Kik has a feature called mentions, which allows you to bring a bot into an existing conversation by calling it up with the “@” button. For example, if you type “@Roll” at the start of a message while you’re chatting with a friend, Roll bot will appear to answer your question. It will even suggest a list of questions you can ask. This focus on sociality means the bot improves rather than interrupts your conversations. We routinely remind users who are talking to Roll bot alone to “Try typing @roll in a group or conversation with a friend!” As a result, the bot’s viral scores have been off the charts. A full 95 percent of Roll’s users have come via viral sharing. If a user typed in something that did not contain “who,” we immediately respond with a help message. Who is most likely to live alone with 5 cats? Who is the best Pokemon Trainer? Do I have to even say it out loud? Ok <name>, I need you to dial it down a notch. Please don’t play these games with my heart, <name>. Can someone besides <name> ask me something? The key to Roll’s early success has been not overthinking the bot experience. 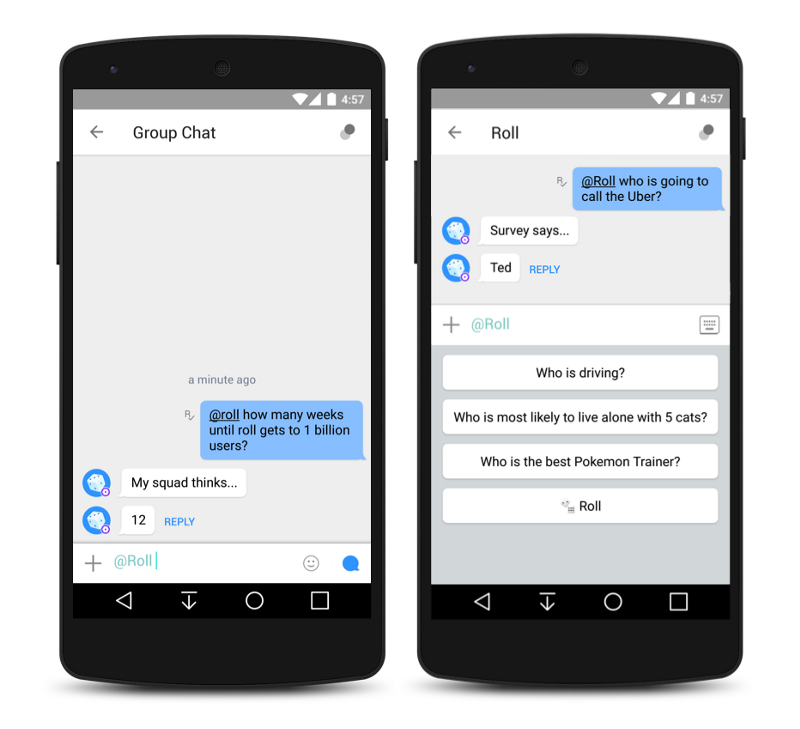 Roll bot is simple and social, and that’s about it. We give the power to the users and then get out of the way. The result has been a bot that has been shared more than we ever hoped for. The experience has underscored an advantage that chatbots have over smartphone apps: They’re super easy to try, and just as easy to share. We’d love for you to give it a try.